On Monday, May 18, 2009, a broad coalition of organizations dedicated to accountable government, and representing over one million members, filed disciplinary complaints with state bar licensing boards against twelve attorneys who advocated the torture of detainees during the Bush Administration. The individually tailored complaints allege that the named attorneys violated the rules of professional responsibility by advocating torture, which is illegal under both United States and international law. Specifically, the Geneva Convention, UN Convention Against Torture, the Eighth Amendment, the Army Field Manual and the United States Criminal Code against torture and war crimes all prohibit torture of detainees. The memos written and supported by these attorneys advocating torture have now been repudiated by the Department of Justice, the White House, the Department of Defense and other experts in the field. The recently released Senate and Red Cross reports on detainee treatment provide uncontroverted evidence that the torture techniques advocated by the attorneys were used on human beings over an extended period of time. 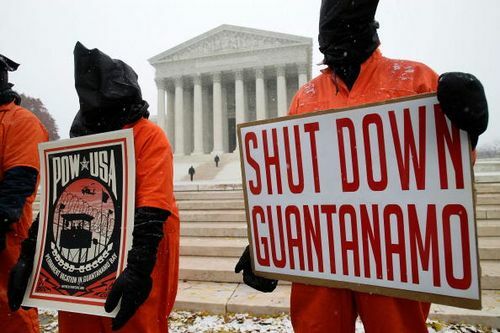 In testimony at a Senate hearing on Wednesday, Former State Department counselor Philip Zelikow told a committee panel that Bush administration officials engaged in a ‘collective failure’ on detention and interrogation of suspected terrorists. He called the torture memos “unsound” because “the lawyers involved … did not welcome peer review and indeed would shut down challenges even inside the government.” Another witness testified that the legal policy constituted “an ethical train wreck” because it violated constitutional, statutory and international law. The coalition expects these twelve complaints to be followed with others after the involvement of additional attorneys is confirmed. Torture is illegal under both United States and international law. The Constitution prohibits cruel and unusual punishment under the Eighth Amendment, and it states that treaties signed by the U.S. are the “supreme Law of the Land” under Article Six. The Geneva Convention and The Convention Against Torture and Other Cruel, Inhuman or Degrading Treatment or Punishment both prohibit torture and have been signed by the United States. These laws provide no exception for torture under any circumstances. Moreover, the United States Criminal Code prohibits both torture and war crimes, the latter which includes torture. The Army Field Manual prohibits the use of degrading treatment of detainees. Despite this well-established law, under the Bush administration, torture was authorized by George Bush and kept secret using classified designations. The White House requested legal memoranda to support its use of torture and it received those authored by a host of attorneys, including John Yoo, Jay Bybee, and Stephen Bradbury. Attorneys who advised, counseled, consulted and supported those memoranda included Alberto Gonzales, John Ashcroft, Michael Chertoff, Alice Fisher, William Haynes II, Douglas Feith, Michael Mukasey, Timothy Flanigan, and David Addington. Several of these memoranda have recently been released, and clearly demonstrate that these attorneys conspired to violate laws against torture and that their actions resulted in torture and death. Accordingly, these attorneys must be held accountable. We have asked the respective state bars to revoke the licenses of the foregoing attorneys for moral turpitude. They failed to show “respect for and obedience to the law, and respect for the rights of others,” and intentionally or recklessly failed to act competently, all in violation of legal Rules of Professional Conduct. Several attorneys failed to adequately supervise the work of subordinate attorneys and forwarded shoddy legal memoranda regarding the definition of torture to the White House and Department of Defense. These lawyers further acted incompetently by advising superiors to approve interrogation techniques that were in violation of U.S. and international law. They failed to support or uphold the U.S. Constitution, and the laws of the United States, and to maintain the respect due to the courts of justice and judicial officers, all in violation state bar rules. We ask other organizations to sign on to this campaign by sending an email to DisbarTortureLawyers@velvetrevolution.us Individuals can sign on using the form at http://www.disbartorturelawyers.com . This campaign will include a broad public relations push so we urge everyone to spread the word and for the press to contact us for comment and interviews. Click here and here for dozens of torture photos and several anti-torture ads that we are making available to organizations and the media. Please give attribution to VelvetRevolution.us. High resolution versions and hours of torture and waterboarding footage are also available upon request. This YouTube music video with waterboarding and torture footage is available for rebroadcast with attribution. this story was NOT in today’s Union-Tribune. Coincidence? I think not.